Tilt to Live is an iphone and ipod touch game by one man left. Its snarky loading screens, 60 second gaming qualities, and Tarintinoesque music have drawn me in as of late. I've been reading a lot of books lately and mainly sticking with StarCraft 2 during my gaming time, but if you know me you know that I am always up for a new 60 second game. Tilt to Live is one I stumbled on and quickly came to love. In Tilt to Live the player is given a ship and tilts the ipod to move the ship around the screen. The ship has to avoid all the red dots on screen while picking up power-ups to destroy the dots. 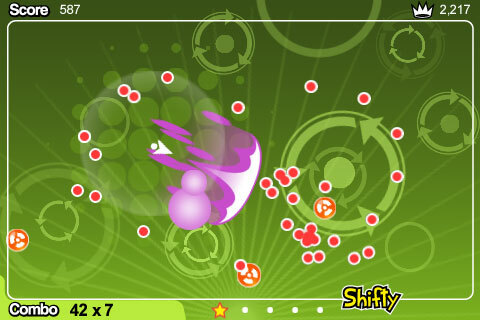 Dots are sometimes static, but often chase the player or create interesting shapes on screen. It falls somewhere between Geometry Wars 2 pacifism mode, a dual stick shooter, and a game with motion controls. It is a simple but addictive game. The sense of dodging, weaving, bobbing, and making insane escapes is intense and fun. I'm getting good at luring packs of red dots near me and then picking up an explosive power-up to destroy them all and build up huge combos. Mostly, I'm having fun in 60 second self-contained packages. As I play more games I am slowly accumulating achievements which unlock new weapons and expand the game experience. Every new weapon changes the way I play the game and makes me want to keep working toward the next weapon. I'm having a great time playing the game, especially in small bursts. I would highly recommend Tilt to Live to anyone looking to pick up a new casual or quick game for the iphone or ipod touch. It is easy to understand and most of my sessions last between 1-2 minutes. For $2 it's a steal.